After a great deal of anticipation while waiting for the greens to dry from my previous post, I'm finally able to lay into the models with some paint. I'm a huge fan of this particular model because of the epic pose it's in, even further accentuated with the lengthened torso and other adornments. So heres what the finished product looks like (or finished until i can find something left to paint on it). 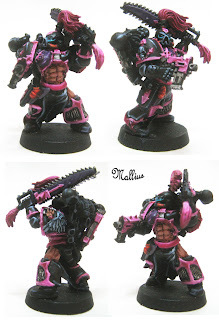 The paint scheme is similar to the test scheme, large black areas with pink trim and purple accents. I'm looking forward to seeing how some of my more "bizarre" creations will turn out after a good coat of paint. I'll post some more greens in a couple days once the sculpts are finished. Once again though i'm left to come up with a basing scheme for these models, i'm not quite sure what would work with these guys.